5 Best Tennis Shoes for Plantar Fasciitis - The best shoes to heal your heel! 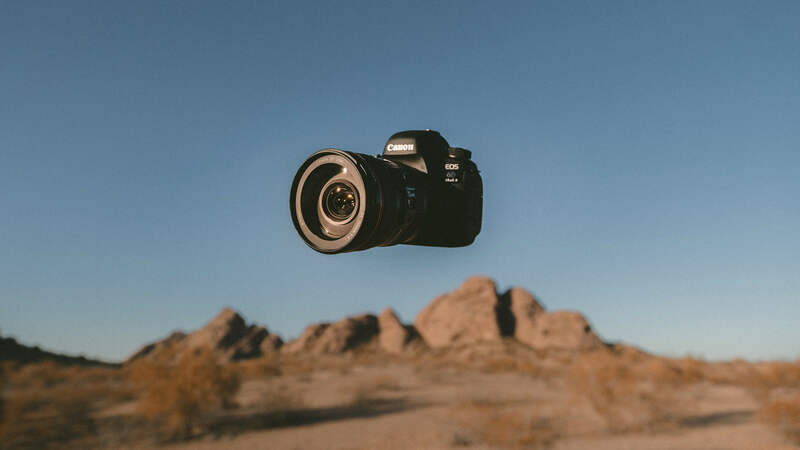 In today’s world, nearly every market, every industry, and every platform is moving towards personalization, customization, and bespoke experiences that are highly tailored to the needs of each individual customer. Here in the sporting industry, that’s no different! And more specifically, for avid tennis players, even those suffering from plantar fasciitis, there are a whole range of products available to you including rackets, shirts, shorts, shoes, and even tennis balls themselves that should help to meet your expectations and preferences each and every time. So think about it, if you require a special racket to help you perform at a higher level, or if you require a different pair of tennis shoes because you’ve got flat feet, you need more support, or if you have Plantar Fasciitis, we can find the shoe for you! Am I the only one suffering from it? NO! In fact, did you know that Plantar Fasciitis is one of the most common ailments that hinder tennis players all around the globe? But why is that? And what exactly is Plantar Fasciitis? More than 3 million people are affected by it each year in the US, making it a fairly common ailment, but what is it about the injury that forces tennis players to search for different types of shoes? Plantar Fasciitis is caused from increased stress on the heel of your foot, awkward walking patterns or types of movements, too much weight being distributed on one heel, or even shock or impact on the heel. The pain can be quite sharp and excruciating at times, and can last for several weeks if not treated immediately. For tennis players, this type of injury can be devastating to their craft, their approach, and their style. And because tennis is such a foot-heavy sport, Plantar Fasciitis has become a common ailment within the sport, but lucky for you – we’re here to bring 5 different types of tennis shoes to your attention specifically designed to help with or prevent Plantar Fasciitis! So, here are the top 5 tennis shoes to help with Plantar Fasciitis! With these shoes, stability is the priority. Keeping your feet stable (particularly in the heel and mid-foot areas) can really help protect you from chronic conditions like plantar fasciitis. With their unique S-Curve technology, they help to minimise the lateral movement of your feet, protecting them against potential strain injuries, yet they don’t feel stiff and restrictive. They also have excellent cushioning, making them one of the best tennis shoes for plantar fasciitis. And yet, comfortable as they are, they still feel light and agile when running around the court. It’s synthetic upper combined with that S-Curve technology, hold your feet in place without sacrificing on breathability, which is particularly important if you play tennis in warmer climates. Their LIGHTENING DRY technology wicks away any sweat keeping your feet dry during play. Finally, these shoes are extremely durable with a rubber outsole that will last a long time. 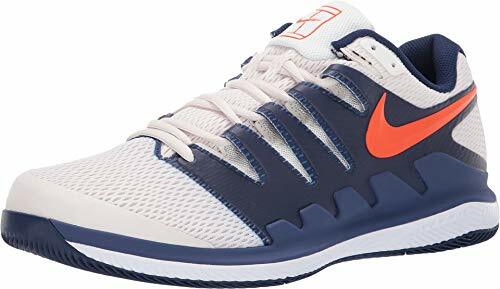 Worn by professionals and designed with the help of Roger Federer, these shoes are often considered one of the best women’s and men's tennis shoes for plantar fasciitis. 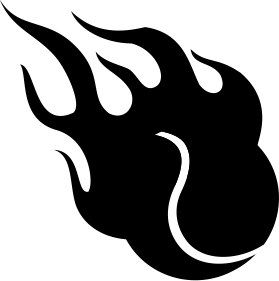 Both versions are linked below. In fact, regardless of their ability to be one of the best tennis shoes for plantar fasciitis they are also one of the top-selling women’s tennis shoes full stop. What makes them so effective is their Nike Zoom Air Unit in the heel which really helps to soften impacts when running on court. Then when you add in the TPU midfoot shank for lateral support and stability, you can see why these shoes offer one of the best all round packages when people are looking for the best tennis court shoes for plantar fasciitis. The only slight issue with these shoes is the price, they are considerably more expensive than their competitors. However, they have produced one of the best shoes on the market to prevent this kind of injury, and as a result you can see how they have arrived at that price. These shoes are widely regarded as the best men’s and women’s Asics tennis shoes for plantar fasciitis. 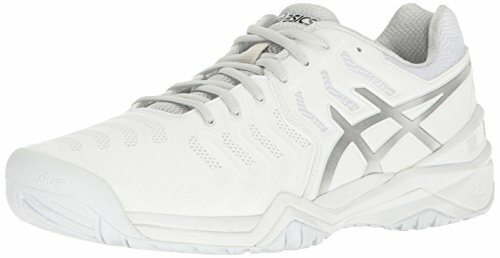 The main feature of these tennis shoes for plantar fasciitis is, as the name suggests, the famous Asics gel cushioning. This is crucial, by giving the heel enough support so that the condition doesn’t flare up in the first place. Despite not being the lightest in this list they still feel like you can play aggressively on court and they are extremely stable, preventing any issues caused by lateral movements. They also come in a range of colorways if you don’t like the look of the plain white tennis shoe. What is more they won’t empty your bank account as they are priced more competitively than some of the other tennis shoes in this list, making them an excellent choice if you are budget-conscious. The Wilson Rush Pro has long been known to be one of the best tennis shoes for people with plantar fasciitis. These lightweight shoes are world famous for their outer sole durability, and they’ve made great strides with the upper by making it wider to remove the comfort issues that plagued the earlier variants of this shoe. What is really impressive with these shoes, is that despite its low profile it still has bags of cushioning, protecting the heel and mid foot in particular. Playing for hours is also no longer a problem with its highly breathable mesh upper that wraps nicely around your foot. 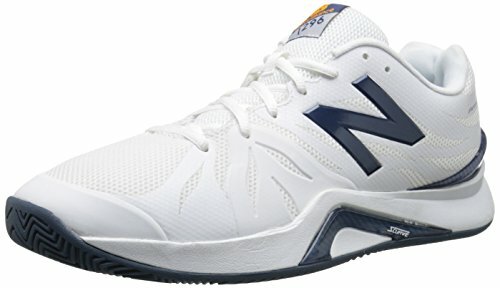 These shoes suit the player who suffer from plantar fasciitis, that still want to be aggressive and on the front foot during matches. These Wilsons' offers the best of both worlds with great heel and arch support, as well as a low profile to increase flexibility and movement. 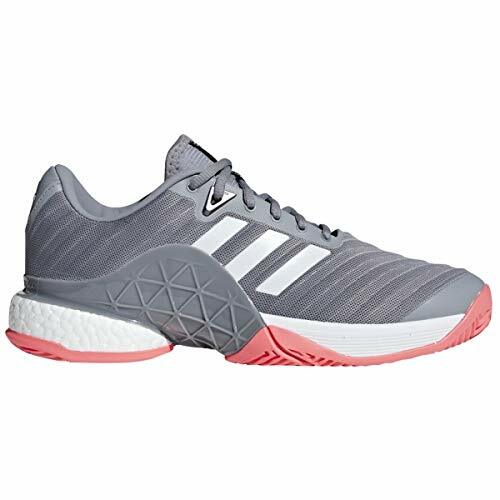 Last but by no means least is the Adidas Barricade shoe, which has been the highest selling tennis shoe of 2016 and 2017. Not only is it a best seller, it is one of the best tennis shoes for high arches and plantar fasciitis. This is because it manages to combine great heel and arch support with high performance and comfort. The ADIPRENE foam in the heel forms one of the best heel protectors on the market, it even gives you that feeling of “bouncing” when playing your strokes. Couple this with both the raised arch support on the side of the shoe and the synthetic holding your foot in position whilst moving, it’s easy to see why this shoe is so popular. If you suffer from Plantar Fasciitis it is very safe to say that the right tennis shoe will help you out and we would always recommend you getting new tennis shoes first. Nevertheless we have to mention the other type of product that helps you too. The ankle support sock. It is definetly worth testing with or without a new tennis shoe. 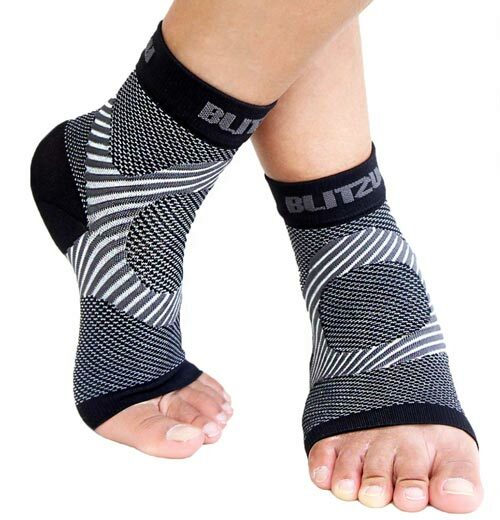 We recommend this sock by BLITZU. If you do end up feeling some pain in your heel after a hard-fought tennis match, keep these three things in mind! Plantar Fasciitis is typically self-treatable – with some rest, some cold and hot compresses, and some extra attention paid the next time you take a step, your Plantar should heal itself naturally over time. You’ll rarely have to make a doctor’s visit, unless the pain is so severe that you’re afraid you may have broken something. You’re not alone! Remember, Plantar Fasciitis affects 3 million people every year! Have you had Plantar Fasciitis? Are you familiar with any of the shoes in our list? If so, be sure to comment down below and share your story!